With a particular passion for technology and innovation, Gonzalo serves as CEO of Wayra, Telefónica’s start-up accelerator, from its birth in 2011. In less than three years, he helped Wayra become one of the largest technology accelerators, opening operations in 12 countries across Latin America and Europe (Colombia, México, Spain, Venezuela, Perú, Argentina, Brazil, Chile, UK, Germany, Ireland and the Czech Republic). Today, Wayra has a portfolio of more than 300 innovative companies in 20 different digital industries. 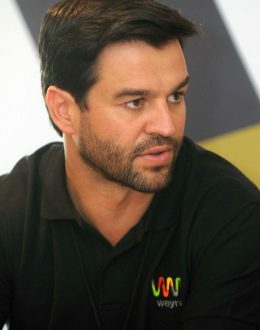 Prior to join Wayra, Gonzalo spent five years as Director of the Secretaría General Técnica (Head of the Chairman’s Office) of Telefónica Latinoamérica, leading projects and initiatives at a regional level. He joined Telefónica in 1997, when he started working in the legal department of Telefónica Internacional, the entity that managed Telefónica´s international operations. In 1999 he was appointed as Legal Manager of Telefónica Móviles, the holding company that managed all the mobile operations worldwide, and in 2002 became Legal Director of Telefónica Móviles México, where he worked for almost three years before returning to Spain.